Up to 90% Discounts: MotoPress Black Friday and Cyber Monday Sales 2016! The sales countdown period is now finished and you can get a jump on your biggest WordPress holiday shopping! 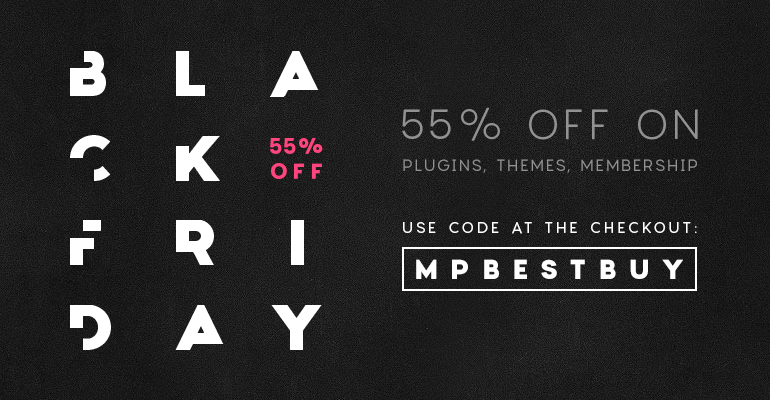 Get a WordPress plugin, theme or addon by MotoPress that you always wanted, with a huge discount, anytime till November 28th. Check out this post to find out more details on each offer and have fun! Emily Williams in MotoPress news November 23, 2016 March 3, 2018 10 Comments on Up to 9010 Discounts: MotoPress Black Friday and Cyber Monday Sales 2016! No more other sale coming? Currently there is any sale at our website but you may follow us in social networks or subscribe with your email to be notified when new discounts are available. If I buy the bundle of WordPress Themes: Emmet, Profit, Artwork and Entrepreneur with Unlimited license, do I also need to buy the Word Press page builder? Page Builder is included in all the themes so you do not need to purchase it again. Monster/TT is at this moment buidling our site with Monstroid theme. If I purchase the Visual Builder and addon will TT be able to install it with no additional cost or will i hear the usual TT comments —-“its not included” in original purchase? Or if i do install, is all EASILY installed with a few buttons pressed…with readable instructions from your end? I’m not sure about TemplateTuning but if you contact us for assistance we’ll assist you with addons installation for Black Friday sale. For Black Friday deal, Is there a discount code for individual add-on? Hi Sumo, sorry, but it could be bought only in the bundle. Happy Thanksgiving!